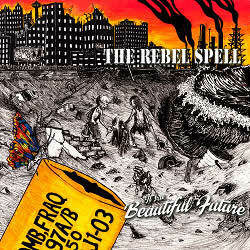 The Rebel Spell – It’s A Beautiful Future CD - Old Punks Never Die! These young but well-established veterans of the Canadian punk scene have pulled off a neat trick with their latest release, managing to capture the passion at the heart of our culture and condense it into 12 tracks and 30-something minutes of life-enhancing music. Packed with more energy than a vegan’s farts, the band blast their way through the walls of oppression with their sounds of inspiration. There’s some pretty clever verbal dissection of the multitude of problems that face people around the world but this only serves to reinforce the common ground – we’re all victims of the colonialist mindset of the ruling elites, whether it’s done by invading armies or imposed by our own home-grown governments and their all-seeing eyes. The Rebel Spell do a damned fine job of shining a light into the dark shadows of the fortresses of the power-crazed, exposing them for the cockroaches they really are. Their ability to lay bare the fetid corpse of capitalism is only matched by their desire to get us all to connect the dots and stand shoulder-to-shoulder against the common enemy. The inclusion of radical folk singer Leon Rosselson’s ‘The World Turned Upside Down’ at the very end of the disc is a fitting climax to all that precedes it, the band infusing it with their own unique passion. I’d go as far as to say it’s destined to become many people’s favourite version of this well-loved tune. It’s really well-balanced when it comes to the musical foundations, perfectly in keeping with the lyrical finesse laid over the top. The bass player double-picks riffs at a speed that suggests he must have some hummingbird genes in his arms, the guitar and vocals dance with the passion of lifelong lovers, while beats are of the solid and hearty variety needed to pull and hold this potent force together. There’s nothing too fancy here, just smart and sharp use of whatever’s within arm’s and tongue’s reach to make a clear and concise point. The Rebel Spell are the essence of political punk rock, and it doesn’t hurt to be reminded once in a while what a great smell that is. Buy from Iron Column Records / the band / Rebel Time Records. Nice review 🙂 I’m looking forward to hearing them. Cheers.